May 23, 2014 -- Northwest Medical Isotopes (NWMI) has an ambitious plan to invest some $50 million to build a radioisotope production facility in Columbia, MO, to manufacture molybdenum-­99 (Mo-99). If all goes as planned, the company could supply approximately half of the U.S. demand for the radioisotope by 2017. The Corvallis, OR-based company has already submitted its application for construction of the 50,000-sq-ft facility to the U.S. Nuclear Regulatory Commission (NRC). NWMI anticipates breaking ground next year and beginning to commission the facility in 2016, contingent upon NRC review and approval, co-founder and CEO Nicholas Fowler told AuntMinnie.com. At peak production, the goal for the Columbia facility is to accommodate approximately half the U.S. Mo-99 demand, Fowler said. Currently, the U.S. consumes approximately half of the global supply of Mo-99, which is the precursor to technetium-99m, one of the most commonly used radioisotopes for medical applications. Because there are no commercial U.S. producers of Mo-99, healthcare practitioners continue to rely on international sources, such as the aging National Research Universal (NRU) reactor at Chalk River Laboratories in Ontario, Canada. Part of the problem is that Canada plans to discontinue Mo-99 production at the site in 2016. 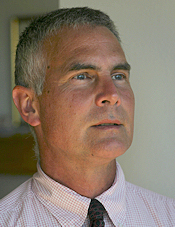 NWMI co-founder and CEO Nicholas Fowler. Issues with the Chalk River facility have caused periodic shortages of Mo-99 over the years, most recently in May 2009, when the reactor was shutdown due to a major water leak. Mo-99 production did not resume until August 2010. Since then, the nuclear medicine and cardiology communities have kept a cautious watch on the supply situation. "While we are in a period of relative predictability, there have been periodic challenges to the supply even in the past couple of years," Fowler said. The company's business plan is to utilize a network of university reactors around the U.S. to irradiate low-enriched uranium (LEU) and transport it to the production facility in Columbia for the extraction and purification of Mo-­99. From there, Mo-99 will be distributed throughout the U.S.
"That speaks to the reliability of supply, so that we can have one reactor operating, one reactor on deck, and a third reactor in queue should there be any issues with the reactor supply chain," Fowler said. "It would remove the traditional issues of one-for-one pairing between one reactor and one processing facility." NWMI has licensed the LEU technology from Oregon State University, which had a hand in creating the start-up firm and continues to support the venture. The university reactors that will supply the facility have not yet been disclosed. The genesis of NWMI began at Samaritan Health Services, a five-hospital system based in Oregon that was experiencing a molybdenum-99 shortage about five years ago, similar to many healthcare institutions. "The entire nuclear medicine and cardiology departments were complaining to the chief executive officer that, in fact, this was a chronic issue," Fowler recalled. "Everyone knew that the issue was only going to get worse going forward in the 2016-2017 time frame." Then came a chance meeting between a Samaritan cardiologist and the manager of Oregon State University's nuclear reactor program. "Reading the tea leaves, Oregon State was already working on intellectual property that would enable a very low-power research reactor housed at a university to produce commercial qualities of molybdenum-99," Fowler recalled. Coincidentally, Fowler knew the principals at Samaritan and Oregon State University, who were trying to form a partnership to solve the Mo-99 supply issue. Before joining NWMI, Fowler spent 25 years at Hewlett-Packard (HP), helping entrepreneurs start and build businesses. He continued along his own entrepreneurial path when he left HP about 10 years ago to start businesses "outside of the corporate womb," he said. "So, it was a natural comingling of talents and resources to pull this [start-up venture] together." Much of the early funding for the project came from Samaritan Health Services. The company then followed a typical path for start-ups, with capital funding provided through private equity and institutional investors. San Francisco-based Dignity Health, which operates hospitals and ancillary care facilities in 21 states, has also taken a financial stake in the initiative. Funding and resources for Mo-99 projects are available through the American Medical Isotopes Production Act, which President Obama signed into law in January 2013; however, NWMI has decided to bypass public money. "We have made a very conscious decision that the only way we will move forward with our business is if it stands on its own two feet without the need for public funds," Fowler said. "It must 'pencil out' based on the private raising of funds and not rely upon public funds." CAC Isomed of Richland, WA, which offers expertise in the nuclear industry and regulatory matters, is also part of the venture, along with NWMI, Samaritan, and Oregon State. "With those four founders, we had everything we needed to form the basis of a new company," Fowler said.